Students DO NOT watch the evening news and certainly do not read a paper newspaper. They may occasionally click on a news site such as CNN or ABCNews, but if they click anything, it is probably BuzzFeed, Vice or ENews. They are not not consuming news; they are just getting it and sharing it in a completely new way. "There are so many ways to make online learning engaging and meaningful." I realized this when the Marjory Stoneman Douglas student journalists broadcasted live via Snapchat and Instagram as their school, friends and teachers were being attacked. Despite horrific circumstances, those student journalists kept the tape rolling to share with the world what was going on in that school. As a result, these young people created a movement that originated and now is communicated with their peers and the world strictly online. This means, as teachers, we need to meet our students where they are – online, all the time. It is challenging because you must constantly change with the technology and what is popular with students, but that is the reality of our business, and I’ll show you how my journey to an online journalism instructor has evolved. I started teaching online media courses in late 2013. Facebook had been around for a while, but Twitter and Pinterest were fledgling outliers. Instagram and Snapchat were practically still in the womb. Fast-forward JUST FIVE YEARS and social media tools have exploded in popularity for teens and young adults. They use devices to communicate – with their friends, parents, teachers, employers. They use social media to maintain their social lives by “liking” and “following” photographs, celebrities and even causes. Students also learn about the world – good and bad – because of social media. I thought: students barely even use email anymore, and if I had to wait 48 hours for an answer to my question about an assignment, I would go nuts! I realized in the session that while some of these tools are great for teachers, they are not necessarily good for the students beyond the face-to-face classroom. Tools like Kahoot and Go Soapbox may be cool in class, but they are not especially useful online. Teachers seem to fear Instagram, Snapchat and Twitter – for a number of reasons – but that is where the students are, and we need to be there, too. I teach the gamut of media courses – introduction to news reporting, writing for mass media, writing for social media and introduction to public relations. I teach all of them online, except introduction to news reporting (for now). At first, this was a real struggle. I was trying to teach online courses like my face-to-face-classes. I quickly learned this was not possible. Online students typically take this type of format because they need the flexibility. They often work full time and go to school. 1. Use the social media that students use: Obviously I have boundaries, but social media tools really do make it easy to give students quick feedback when they need it. I use Twitter in my classes since that’s what journalists use. I permit them to DM me with questions and comments, and my response time is actually far faster than traditional email. 2. Live Stream guest speaker events: Twitter Live and Periscope are great tools for livestreaming events with professional speakers. Use whatever tool is comfortable for you and where you have the most followers, but FYI – students are no longer using Facebook. For these events, I collect my student questions ahead of time, so they can “ask” questions during the event, too. 3. Study the apps and available technology: Do you want to hear students practicing interviews with sources? Have them record it and send it to you in an audio file. Want to have students build their “professional brand”? Give them an assignment building a LinkedIn profile. Want your social media students to be able to post “professionally” designed content? Introduce them to Canva (free) and have them begin creating and posting. There are TONS of choices out there. Find the free and easy-to-use tools. Share them and use them. 4. YouTube is your friend: There is so much great content on YouTube. Students like to watch videos, so let them. I use a great video from Dr. Kim Zarkin that teaches new journalism students how to use the AP Stylebook. I then make up a series of quizzes that gets them using the book and recognizing important style elements. 5. Be present: “Talk” to your online people — FREQUENTLY. Each semester, I host virtual conferences (for a grade) via FaceTime, Skype or Google Hangout. Not only is this simulating real-world distance meetings, it is an opportunity to check in with these people, so they can put a face with the stranger behind the computer screen. Is it time consuming? Yes, but it is totally worth it. There are so many ways to make online learning engaging and meaningful. There are so many cool tools to use to make this work. Some come and go, but if you pay attention to the right people (other faculty and colleagues), the industry and the kids, you’ll know what is working and what is going to be obsolete. Embrace online learning. It is here, and it is the future. 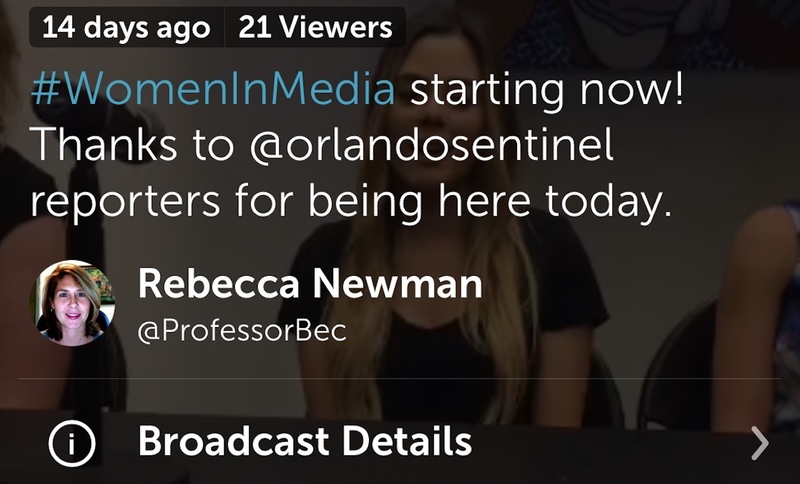 Rebecca Newman is a media professor at Valencia College in Orlando, Florida. She is the faculty advisor of the Valencia College student news organization, Valencia Voice.